Celebration seems to be the name of the game at the end of the year, and this year, we want to celebrate you! Collect points through select missions and use them at TankRewards.com for great prizes! We want to make the holidays a little brighter for less fortunate kids, but we need your help! Spread the word about TankRewards.com and help us get 10,000 new players to participate. For every player who logs into Tank Rewards for the first time on our way to the goal, we'll donate $1 to Toys for Tots (plus we'll add some Credit-based Personal Reserves to the first level of prizes when we hit $10k). Get yourself some prizes, and make a difference in a child's holiday! 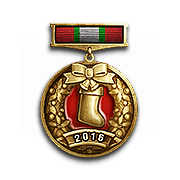 Dec. 2 - Jan. 9: Get a point each day that you earn 20,000 XP in tiers IV+ (Up to 38 points). Get a point for each Mastery Badge "Ace Tanker" earned on the featured tanks (Up to 16 points). *See "Missions" tab in game for additional rewards!